Have a question on Range Rover Sport? Range Rover Sport is available in 12 different colors - Indus Silver, Kaikoura Stone, Santorini Black, Firenze Red, Fuji White, Corris Grey, Yulong White, Estoril Blue, Silicon Silver, Byron Blue, Carpathian Grey and Narvik Black. Watch latest video reviews of Land Rover Range Rover Sport to know about its interiors, exteriors, performance, mileage and more. Range Rover Sport is the most agile, dynamic and responsive Land Rover ever. For the individuals who seek an adventure filled all muscle driving experience, the new Sport is the epitome of SUVs which packs the muscle structure of a Range Rover along with extreme speed credibility. First introduced in 2005, the car has now received an overwhelming response from the customers across the globe and is one of the most renowned SUVs in the markets of UAE. The gained acknowledgement from customers will further help the second generation Sport to further improve the position of the company in an effective manner. The cockpit of Range Rover Sport gives you an effective sports command driving position and the latest innovations have been incorporated to deliver complete comfort, enjoyment as well as exhilaration. 19 speakers coupled with 825 W Meridian Surround Audio System leaves no nail loose in creating a concert like experience for the occupants and the optional 8 or 10.2 inch TFT screen act as an interface for different functionalities of the infotainment system. The boot space is also a sumptuous 784-litres with the rear seats up, whereas with the rear seats down it is a huge 1761-litres that could gulp in almost all the luggage requirements. Born from a relentless drive to create a contemporary yet authentic design, the SUV is streamlined front elevation as well as rearward sloping grille that exemplify the road presence of the car. The strong body curves to its floating roof and fast raked windscreen angle, everything has been designed to raise the bar of Range Rover Sport. The sharp, long front HID lamps and the extended tail lamps gives the car a macho look. The overall dimensions of the car measures 4856 mm X 2073 mm X 1780 mm (L X W X H) and the wheelbase measures 2923 mm that gives ample cabin space along with appropriate stability. To further enhance the character, an individual can choose from either (19/20/21/22) inch alloy wheels. Land Rover Range Rover Sport is available in a total of 5 variants namely HSE, HSE Dynamic, Autobiography, AutoBiography Dynamic and SVR. The improved range of engines use the latest technology and are designed with lightweight all-aluminium that results in improved fuel efficiency. The 3.0-Litre V6 engine delivers the maximum power of 340 PS at 6000 rpm along side a maximum torque of 450 Nm between 3500 to 5000 rpm. The top-of the line huge 5.0 Litre V8 supercharge engine further improves the power output, measuring 550 PS between 6000 to 6500 rpm and maximum torque measures 680 Nm between 2500 to 5500 rpm. The sport is exceptionally fast and touches 0 to 100 kmph mark in a fascinating time span of 4.7 seconds (LR Supercharged 5.0 engine) along with a top speed of 260 kmph. The new developed engines delivers a fair fuel economy ranging between (13.8 to 11.3) L/100 km. Strength is nothing without control and Range Rover Sport is equipped with ventilated disc brakes coupled with Anti-Lock Braking System (ABS), Electronic Brake Force Distribution System (EBD) as well as Brake Assist for effective braking. The handling gets better with the involvement of Electronic cross linked air suspension with automatic load leveling, further coupled with light Electronic Steering wheel that makes it easy to turn on corners and turn. The other salient features include air bag system (front, side and curtain), Roll stability control, hill descent control, electronic traction control and parallel as well as perpendicular park assist. Range Rover Sport is a classy beast, a tremendously crafted masterpiece which is meant to reach incredible speeds as much as it is meant to stand rock strong. The versatility of this luxury gives it an edge over any SUV of the line-up or in the world for that matter of fact. What is the price of Land Rover Range Rover Sport? 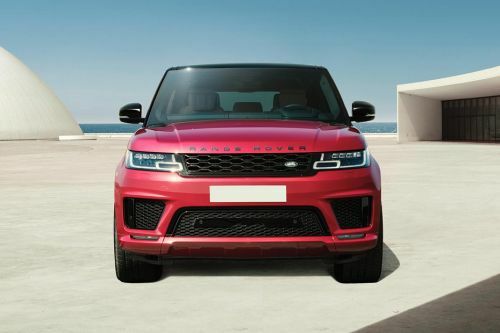 On road prices of Land Rover Range Rover Sport in starts from AED342,400 for base variant 2.0L SE (300 PS), while the top spec variant 5.0L V8 SVR (575 PS) costs at AED623,200 . What are the colors options available in Land Rover Range Rover Sport?